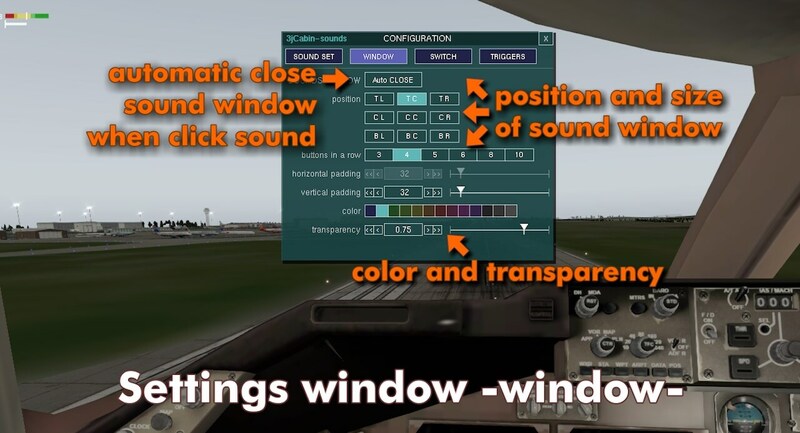 We’re pleased to host – of course with the approval of Jörn-Jören Jörensön aka 3j – his 3jCabin-sounds | Sound engine plugin X-Plane 10 version 1.17 lua script. 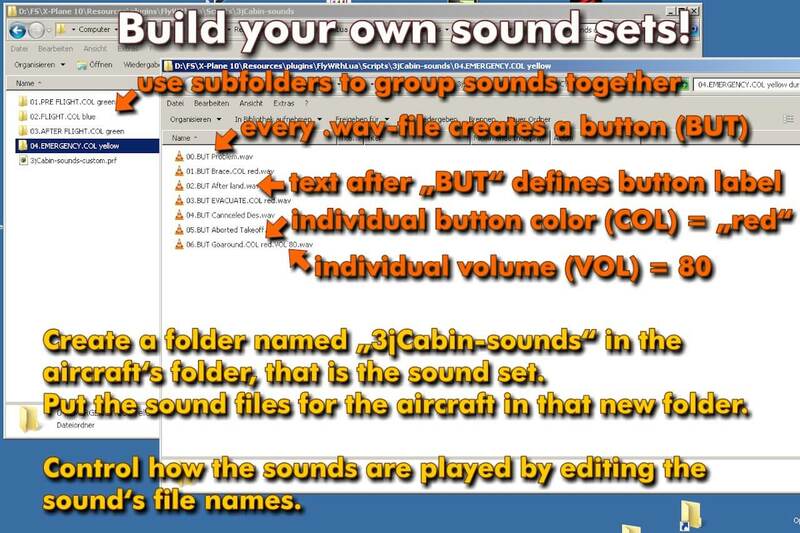 A FlyWithLua plugin that lets you build your own sound sets for your planes. you can use it for announcements, crew, passengers, background sounds, music or whatever you think of. You have manual sounds that are played by pressing a button. These are perfect for announcements of captain or crew, boarding music, etc. You can also have automatic sounds, that are triggered by events (e.g. take-off, landing, g-forces, random, …). These are perfect for passengers or background sounds. For example, let passengers applause after landing (tourist charters) or hear them panic when flying harsh manoeuvres. 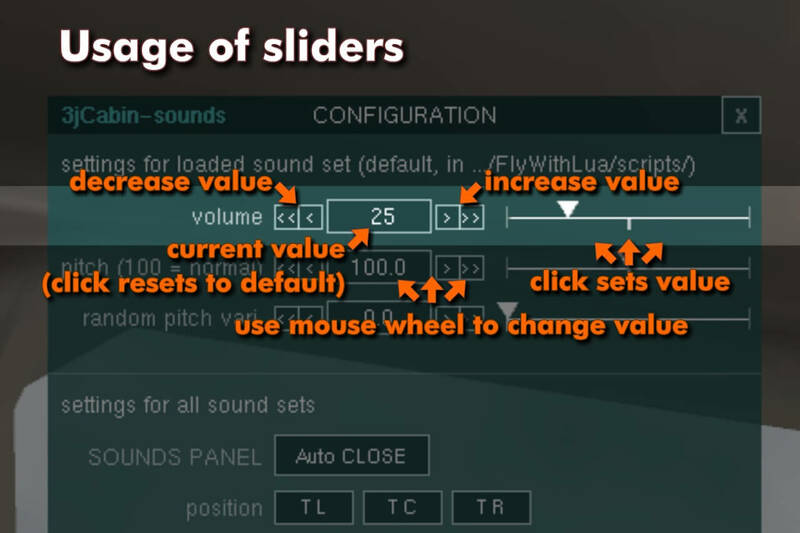 When there are manual (button) sounds in the loaded sound set, you will see them in the sounds window. Click on a sound button and the sound will be played. Click on the small “!”-button on the top right of the sounds window to open the settings window. 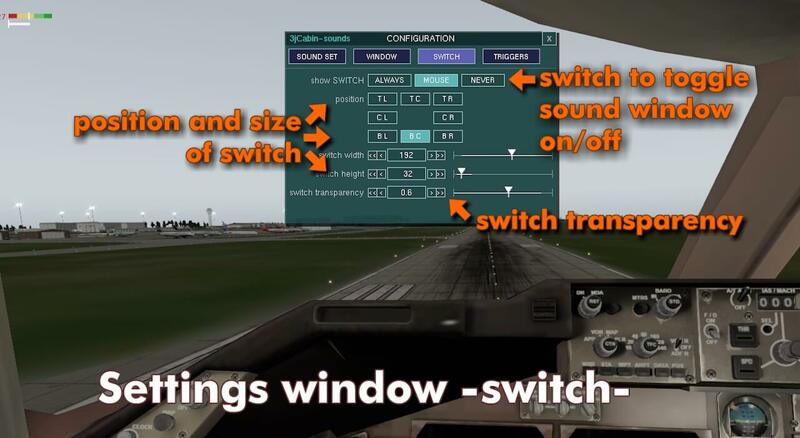 Here you can edit settings for the current sound set (volume and pitch) and global settings (look, size and position of the sounds window, size and position of the open switch). Click on the small “X”-Button on the top right to close the sounds window. – Perfect for announcements of captain, P.A., boarding music, passengers, ambient sounds etc. Install current version of FlyWithLua, if you don’t have it already, download it from this X-Plained.com link. Install my library 3jLib1 version 1.2 or higher (put jjjLib1.lua in ‘/Resources/plugins/FlyWithLua/Modules/’ folder, not ‘…/Scripts/’ folder!). Copy 3jCabin-sounds.lua to ‘/Resources/plugins/FlyWithLua/Scripts/’ folder. I have installed 3jCabin-sounds, why nothing happens? 3jCabin-sounds alone is just a sound engine, you need a sound set (collection of wave files) to make it work. Is there a folder named ‘3jCabin-sounds’ in ‘/Resources/plugins/FlyWithLua/Scripts/’ folder? What sound sets are in this download? There are 3 simple but very nice demo sound sets, the sounds were collected by KLM Pilot 2000. The sounds come from Simmershome’s ICA tool (https://simmershome.de/intelligence-cabin-anouncements-ica/) and are used with kind permission by Rainer Kunst. The sounds are copyright by Rainer Kunst, no usage or distribution other than personal use in these sound sets! There is a standard one in english and an alternative in german. 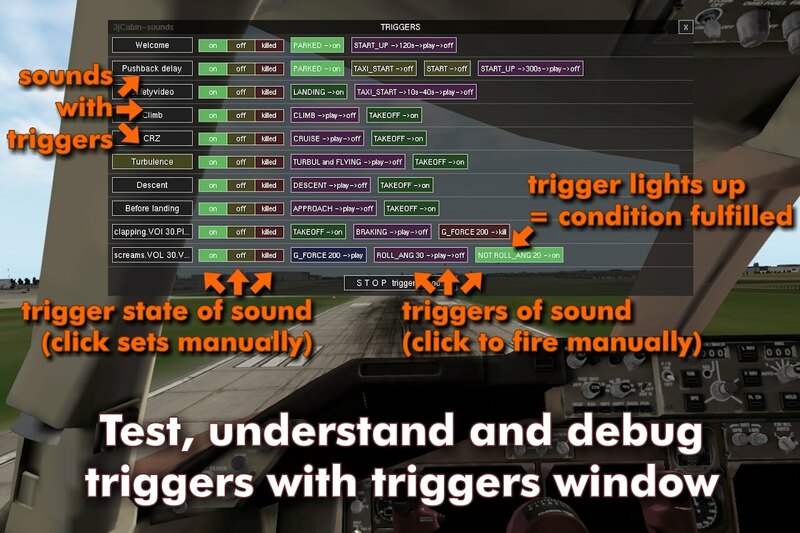 Also there is one Sound set in 3jCabin-sounds – DEMO sound set with triggers.zip file, this has sounds that will be played automatically (by triggers). It may not be perfect, but it should give you an insight what can be done with triggers and how it is done. If we are lucky, users will create some sound sets with selfmade sounds and publish them here on the .org. Are there freeware sounds/sound sets by other users for download? There are 3 simple but very nice demo sound sets, the sounds were collected by KLM Pilot 2000. The sounds come from Simmershome’s ICA tool. and are used with kind permisson by Rainer Kunst. The sounds are copyright by Rainer Kunst, no usage or distribution other than personal use in these sound sets! There is a standard one in english and an alternative in german. 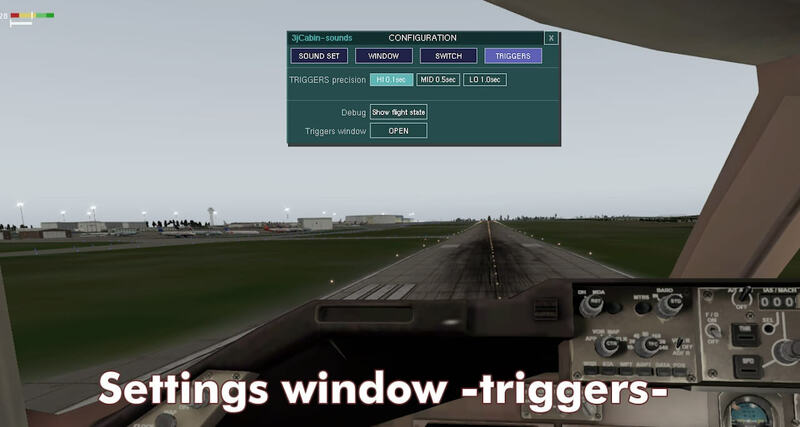 Also there is one Sound set in 3jCabin-sounds – DEMO sound set with triggers.zip file, this has sounds that will be played automatically (by triggers). It may not be perfect, but it should give you an insight what can be done with triggers and how it is done. If we are lucky, users will create some sound sets with selfmade sounds and publish them here on the .org. Sounds for personal use can be collected in the internet for example. See this video by KLM Pilot 2000: How to get sounds by KLM 2000 on Youtube, but PLEASE respect the copyright and do not spread or publish sounds without explicit permission of the rights owner! What sound files can I use? You can only use wave files (.wav), other formats are not supported by FlyWithLua. If you have .mp3 files or other, you have to convert them to .wav first. How can I define my own sound set? How can I define a default sound set for all planes? Put a folder named “3jCabin-sounds” in the FlyWithLua scripts folder ‘…/X-Plane 10/Resources/plugins/FlyWithLua/scripts/’ and put the sounds in there, as described above. 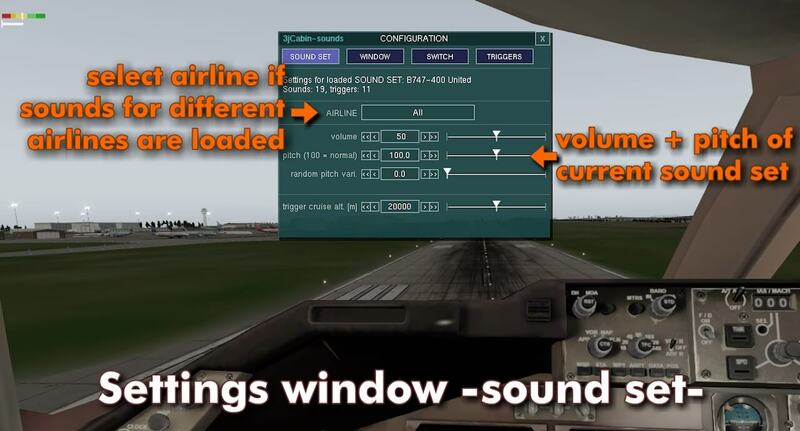 This sound set will be selected, when the current aircraft has no own sound set in its folder. For what do I need subolders in the sound set? Many thanks to KLM Pilot 2000 for giving me the idea for this plugin, sound sets and testing. He also made a preview video: 3jCabin-sounds PREVIEW by KLM 2000 on Youtube. 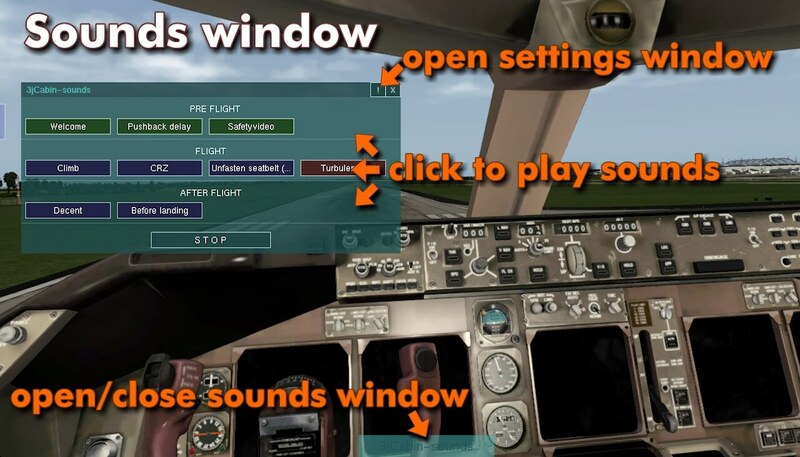 There is another presentation video for the plugin, many thanks to X-Plane Tower for making it. 3jCabin-sounds presentation by X-Plane Tower on Youtube (French with english/german subtitles). You have to install my 3jLib1 library. See “installation instructions” above! It looks like FlyWithLua can not handle more than 100 sounds. After that FWL stops or sometimes X-Plane hangs/crashes. This limitiation is for all FlyWithLua scripts together, Please look at the FWL log (FlyWithLua_Debug.txt), there are all loaded sounds listed and you can see how many sounds are loaded by other FlyWithLua plugins. Unfortunately the way subfolders are named has changed a little. Please see the red update info on the top of this page for details.